My niece Jennifer is a fantastic baker. She regularly wakes up early to take her classmates warm muffins for breakfast and so it will come as no surprise to hear that she is very popular at school. We visited her and her (very cute) sister Daria in Poland last summer and were spoiled with Jen's culinary delights. 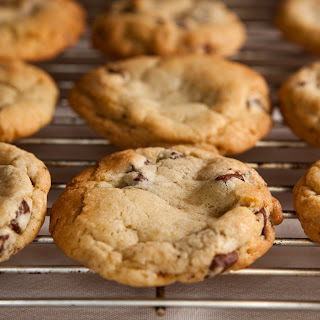 Probably my favourite recipe were the cookies below - they were soft, sweet and chewy with just the right amount of chocolate; In essence they are my idea of the perfect chocolate chip cookie. In a bowl cream together the butter, light brown sugar and caster sugar until the mixture is light and fluffy. Add a little of the egg to the creamed butter and sugar mixture, Mix well until it is combined. Repeat until all of the egg has been added. Now add the vanilla extract and stir again. Sift the flour, baking soda, baking powder and salt into the mixture. Mix until the ingredients have combined. Wrap the dough in clingfilm and leave to rest in the refrigerator for at least 24 hours. When you are ready to bake the cookies, preheat the oven to 175 degrees Centigrade. Using a spoon, scoop ping pong sized balls of dough. Reshape them gently with your hands as required and place them onto the baking parchment. Leave plenty of space to allow them to spread. Bake the cookies until they are golden brown but still soft - in the region of 10 minutes. They will be slightly puffy when you remove them from the oven but will flatten as they cool. Cool the cookies on a baking rack. Hi Reena it's me Daria and I'm so happy I'm on your blog!!! I'm at school right now and I'm supposed be on a "educational website" but I couldn't help looking for myself in the internet! Can't wait to see you in May! !